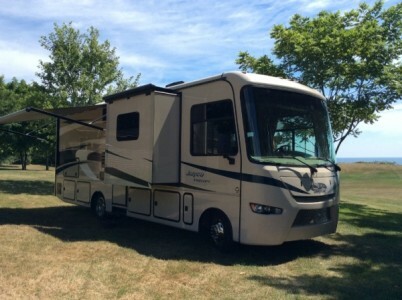 2015 Jayco Greyhawk 31FK Class-C Motorhome. 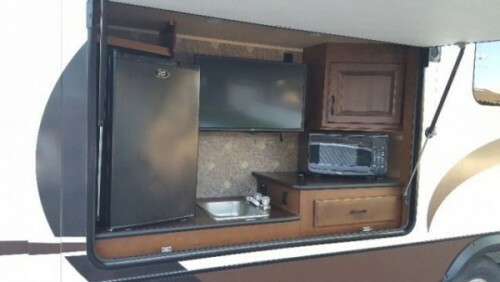 Like new barely used RV, loaded with satellite tv,onboard generator, sleeps 8, comes loaded with appliances and utensils, furnace and AC. Selling because not enough time to use it. Please call 705-363-6152 to view. Upgraded pillowtop mattress, Glazed cherry cabinetry, raised cherry refrigerator inserts, High gloss metallic fiberglass sidewalls, U shaped dinette with table which stores when travelling, Onan 5.5kw generator used only few hours, Onboard fueling station, Central vac. Financing available at very reasonable rates. Please call 403-589-5941 to view. 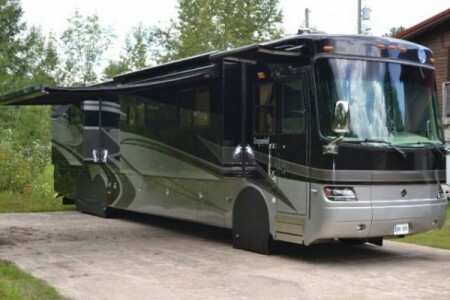 2014 Winnebago Era 70A Class-B Motorhome. The Class B market continues to grow, in large part due to the success of the Era®. Its combination of fuel efficiency, maneuverability, and high-end features has introduced a whole new set of enthusiasts to the van-style RV. With its Mercedes-Benz® diesel engine, driving your Era is a pure joy. Arrive at your destination safely and on time with the help of the Radio/Rearview Monitor with 6” touchscreen and the available Rand McNally RV GPS. Each floorplan offers a full-featured galley and swivel cab seats that increase your functional living space while parked. Inside, you’ll find LED ceiling lights, MCD blackout roller shades, and Corian® countertops, while an awning with LED lighting will keep the outdoor fun going well into the night. Please call 613-327-8021 to view. 2012 Winnebago Itcasa Sunova 33C Class-A Motothome. 34.5ft , ike New, Fully Equipped. Full Body Paint. Call 519-326-6681 for full details and we can email a PDF document with full details. 2008 Glendale Titanium Fifthwheel. Original owner. Great condition. Fireplace, four slides, queen bed, hide-a-bed, 2 recliners, room for washer/dryer, built in vacuum. Please call 780-865-6830 or Cody 780-865-8761 to approve. 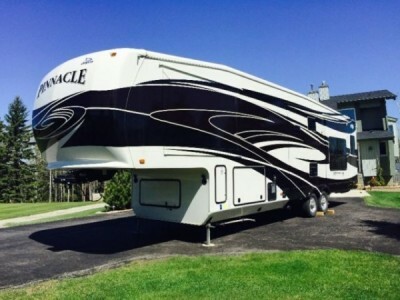 2014 Renegade 45ft XL Motorhome Model# 3300RF comes with matching Renegade 30ft Stacker Trailer. This unit is in immaculate new condition and offers top of the line features inside and out. Please call for full spec sheets. 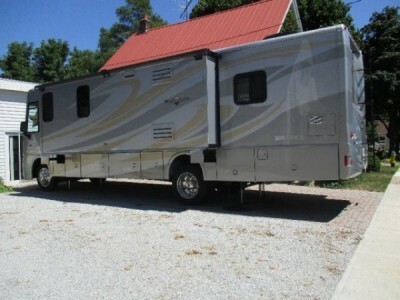 This is a private sale motorhome with financing options available. Please call Mike @ 778-754-7414 for more information. 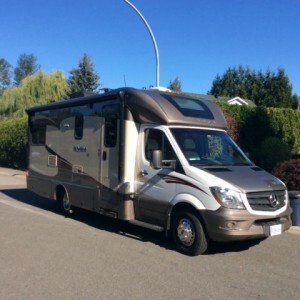 2013 Forest River Solera 24S Class-A Motorhome. Super 2013 Mercedes Benz Sprinter Diesel 3500 Chassis with V6 engine dual rear wheels. Excellent condition, no smoking, no pets. All the bells and whistles to many to enumerate, send email I will fax you the spec sheets. Please call 819-627-6129 to view. OBO. No DEALERS PLEASE. 2007 Georgie Bay Pursuit 32Ft Class-A Motorhome. Very low Kil, 3 slides, built in Onan generator, 2 roof airs, backup camera, lots basement storage, 32.25ft.long Ford V10. Please call 780-786-2493 to view. 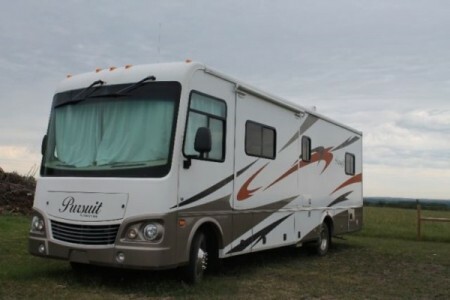 2007 Holiday Rambler Imperial Limited 42PBQ Class-A Motorhome. Immaculate, covered storage in heated shop. Motor 400 Cummings Diesel. New Tires in November installed, Leather optional tire covers, optional window covers Many upgrades, New Sony TV, Kenwood flat screen in Dash, Led head lights and upgraded tail lights, No smokers, no Pets, Engine brake. Tag axle. Aladdin coach monitoring system. 10,000 watt Onan generator. Air & hydraulic leveling system. 2 side view cameras. Back-up camera. King-Dome satellite system. Full size bottom freezer refrigerator. Deluxe cherry cabinetry upgrade. 2 burner gas cooktop. Microwave/convection oven. 3 roof A/C & heat pumps. King size Sleep Number bed. DVD home theater system. Safe in bedroom closet. Aqua-Hot water heating system. Sanicon waste pump. Automatic power cord & water hose retrieval. Keyless entry system. Remote control awning. Power roof vents with rain sensor. Abundant basement storage w/slide out tray. Please call 705-457-5453 to view. 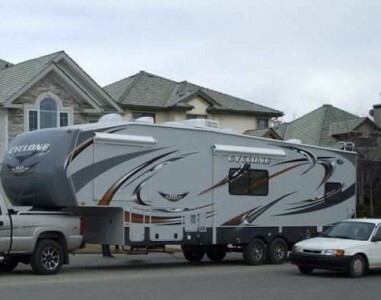 2007 Damon Tuscany + Trailer Class-A Motorhome. one owner/driver. The unit is 40ft long, 3 slide outs, with a 6-spd manual tran, Freight Liner diesel engine, hydraulic leveling system, 6 new tires, air brakes, and also for sale we have a 30ft trailer with matching paint job, spray-on truck bed liner on floor, wood panel walls, storage cabinet, and an electric tongue lift. Includes Custom 30Ft painted trailer. For more information and pictures please call 416-460-0703 or 416-717-7794. 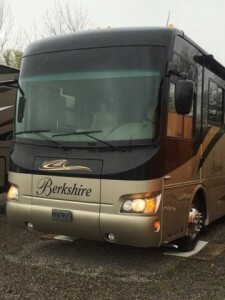 2011 Forest River Berkshire 390QS Class-A Motorhome. 340HP Cummins ISB6. 7 engine, Allison 2500 6spd transmission, Freightliner XCR chassis, 55 degree wheel cut, ABS air brakes, Combination Washer/Dryer, Microwave/hood combo, 3-Burner Stove, 12cu ft Stainless Side by Side Refrigerator/Freezer with ice maker, Satellite System, Surround-Sound AM/FM/CD Stereo Receiver, Satellite radio prepped, DVD Player, (2) Flat Screen TVs, Backup Camera, Side View Cameras, Cruise Control, Tilt Steering, 8.0kw Onan Diesel Generator, Slideout Tray for Generator, 2000 Watt Inverter, 2 AC units w/Heat Pumps, Furnace, 10 gal. Gas/Electric Water Heater, Automatic Hydraulic Leveling System, Air Ride Suspension, Exhaust Brake, (2) Power Patio Awnings w/Wind and Rain Sensor (1 w/remote), Awnings w/Toppers for Slide-Outs, Tinted Dual Pane Windows w/ Pleated Shades Through-out, Raised Rail frame for Full Pass Basement Storage, Slideout Tray in Basement Storage, Rear Ladder, Trailer Hitch, Tow Package, Heated Mirrors, Outdoor Shower, Automatic Electric Step, Diamond Shield front-end wrap, No Wax full body paint protection, 3yr old Michelin XXE275/80R 22.5 tires, Executive Cherry Cabinetry, Dinette, Ceramic Tile Floor Throughout, Corian Countertops, Illuminated Glass Liquor Cabinet, Soft Touch Leather Sofa Queen Sleeper, 1 1/2 baths, Glass Shower Enclosure, Soft Touch Leather jack knife Sofa/Sleeper, (2) 6-way Leather Power Captain Chairs, Queen Size Bed, Windshield Power Privacy Shade and Power Visor, Side Window Privacy Shades, Passenger Side Laptop Counsel, Skylight, Double Sliding Mirrored Wardrobe Closet, LPG/Smoke Detectors, Power cockpit night & sun shades, safe. Includes Hydralift USA hydraulic motorcycle lift (1,000 capacity)golf cart/ATV platform adaptable, 10,000 lb Blue Ox tow bar. Original Owner. ***Transferable bumper to bumper warrant until May 2020*** Please call 905-351-2007 for more info. 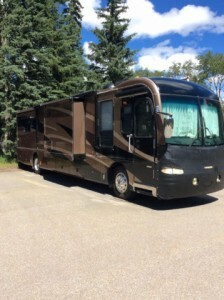 2003 Fleetwood American Eagle 40Ft Class-A Motorhome. Diesel pusher with 400 cummins SLH. Two slides (one full slide and one bedroom slide.) Has 100 gallon water storage and 110 gallon grey and sewer water storage. Originally was a show home motorhome. In excellent condition. Please call Roddy at 250-261-3644 for more info. 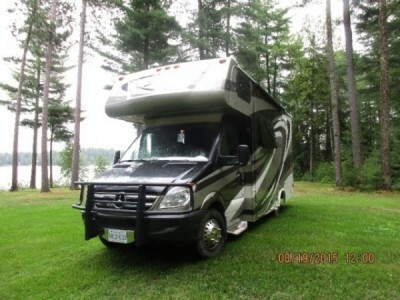 2007 Forest River Lexington SS 300 Class-B+ Motorhome. 30ft, gas with gen, large slide, 6 new tires, 2007. Tow package, artic Pak, entertainment centre, Apollo half time oven. This unit is in excellent condition. Please call 780-639-1490 to view. 2013 Coachmen Catalina 32Ft Trailer. Perfect for couple or family of four. Big slideout in kitchen and living room area. Bedroom with queen size bed. Loads of storage on board and underneath. Sleeps 4 with pull-out couch. Has big roof-top solar panel, oversized tanks, TV and everything you would expect with a trailer of this type. Electric jack and new equalizer hitch included. Trailored from the US and was pulled only 35km during its whole life. From Olds to Sundre. Please call Brad at 403-850-7025 for more details. 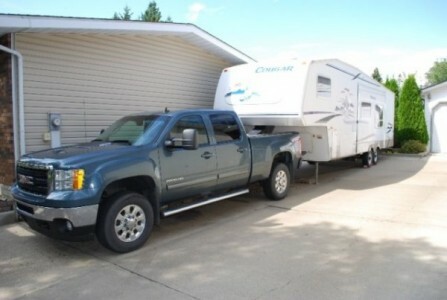 2004 Keystone Cougar Fifthwheel + 2011 GMC Sierra 2500HD SLT Truck Combo. 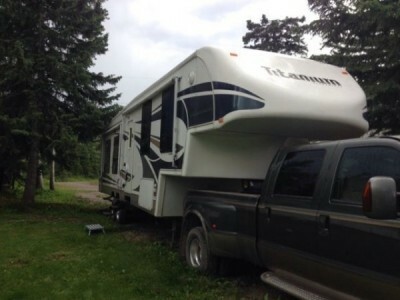 Truck and trailer together, great condition, 2 - 30# propane tanks, queen bed, pullout couch, separate kids' bedroom with bunks, 12ft slide, new battery this year, A/C, polar package. 2011 GMC 2500 HD SLT. 6.6L. Duramax w/Allison trans, crew cab, roll top box cover, leather, 134,000 kms, winter wheels and tires. Please call Randy @ 780-974-6606. 2014 Winnebago Itcasa Navion 24G IQ Class-C Motorhome. 2 slide outs, Queen walk around bed, luxury recliners, solar panel, premium battery set up and more. Please call 604-427-0030 to view. 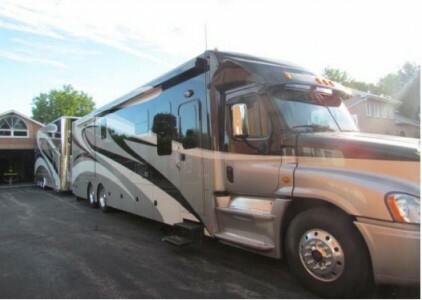 2012 Newmar Kountry Aire Fifthwheel. like new. Available September 2016. 37ft, dual axle, 17000 dry weight. This high quality unit is in excellent condition. 3 slide outs. Auto level, washer, dryer, custom paint. GE convection/ microwave combo, 3 burner propane stove, 4 door frig. AC, furnace, fan and heat pump modes on thermostat. Lots of storage. Built in vac. Please call 306-893-7140 to view. 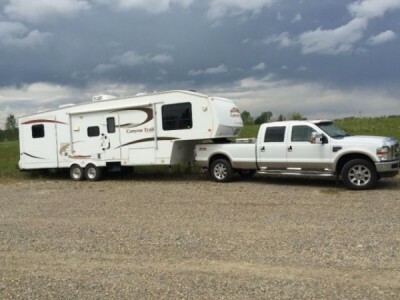 2009 Gulfstream Canyon Trail Fifthwheel + F-350 Truck Combo. Two slides. Bunks. Two bathrooms. Air conditioning. Non smoking. Sleeps 8. Seldom used. 2008 Ford F-350 Lariat Crew Cab. Diesel. Fully loaded. Low mileage. Long box. Will sell separately. Please call 403-601-6772 to view. 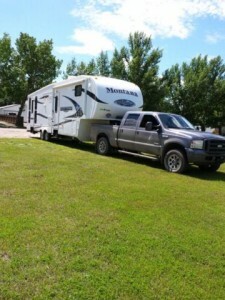 2010 Keystone Montana Mountaineer 347TH Fifthwheel + 2006 Ford F-350SD 4x4 Lariat Diesel Truck Combo. Truck has 6.0L engine.Truck has 220000 KM. 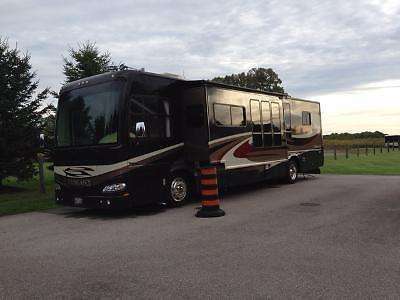 THE 5TH WHEEL IS 4 SEASON Lived in for 3 years on a RV lot all year round very warm in winter just skirted. Back room / office Toy Hauler works nicely as a place to walk into and leave outerwear and also leaves cool winter weather away from living space. We are a older couple who looked after the unit very well. we relocated to a house so we don't use 5th wheel any longer and don't need truck if we don't have 5th wheel. Both are in good condition. 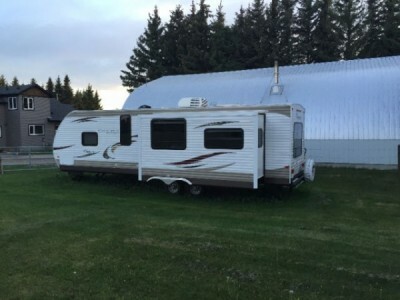 Please call Ivan @ 306-278-7209 or Irene @ 306-278-7012..
2014 Jayco Eagle Premier 351RSTS Fifthwheel. TWO years of WARRANTY remaining. 42.5Ft, Slides 3, Sleeps 3, King Bed. 4-point auto leveling jacks. Keyless entry. 12 cu.Ft. Refrigerator. 30in residential-grade convection microwave with oven. Large pantry. Fireplace. TV in living room and bedroom. Indoor/ outdoor/ bedroom stereo/ DVD system, Reclining theatre Seats, Reclining sofa, Free standing table and chairs, Large shower, Two air conditioners, Awning, Outside grill, Outdoor security lights, LED lights under awning, Tons of storage inside and out! Outdoor Kitchen Includes- Mini fridge, Microwave, Sink, TV, Cupboard space. For inquires please call Jimi by phone 306-570-4595. 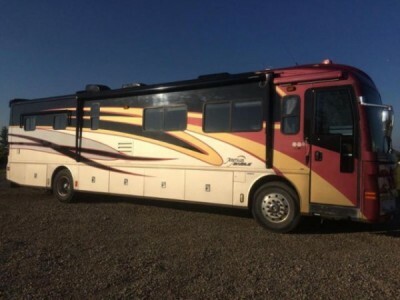 2000 Monaco Diplomat 36Ft Class-A Motorhome. 5.9 Cummins diesel engine automatic transmission with airbrakes self levelling jacks. Two slides awnings over windows and doors and slides. 7.5 kW generator onan. Trades welcome. Trucks quads etc. Call Wally at 780-940-3389 to view. 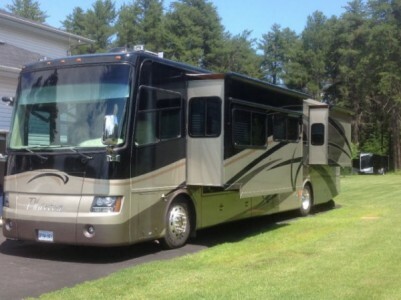 2008 Tiffin Phaeton 40QSH Class-A Motorhome. Sleeps 6. Washer and dryer. 2 air conditioner. Auto awning. Auto leveling . Will deliver. Please call 306-457-7712 to view. 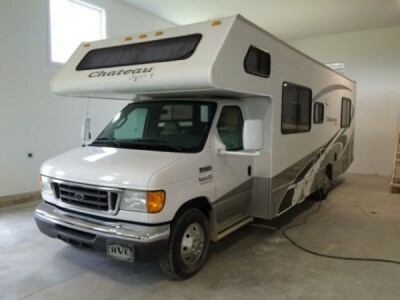 2007 Four Winds Chateau 29Ft Class-C Motorhome. Diesel, Brand new turbo, Airbags , upper bed, Brand new. Sleeps 8, Bbq tied into propane, AC. Please call 403-322-7036 to view. 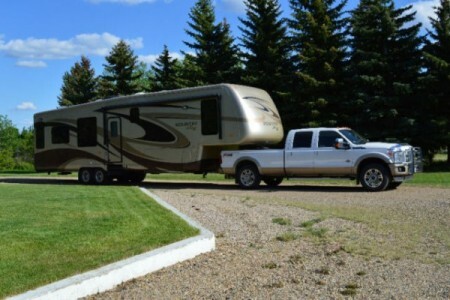 2015 Palomino Columbus 370RL Fifthwheel. 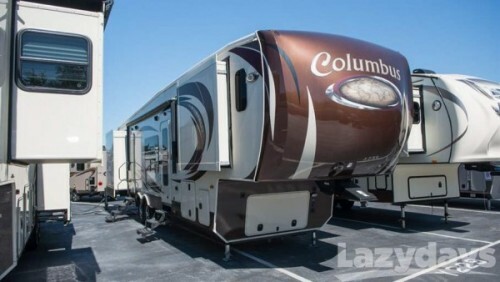 This front living Columbus fifth wheel by Palomino RV has everything you need, and the spaciousness you want, for traveling. Plus, it features five slides! As you step inside model 370FL you will see how spacious it is with a dining table and two chairs just inside the forward most entry door. There is a double sink with overhead storage up against the interior wall, a slide out three burner range, roll-out pantry, refrigerator, and a counter area with storage below. Step up to a front living space with slide out entertainment center. Enjoy the 80" sofa sleeper up front with end tables on either side while watching TV, or for extra sleeping space. There is also a set of recliners in a slide out also. Heading back toward the rear of the unit there is a side aisle bath featuring a linen closet or washer/dryer option, toilet, sink, and corner shower with dome. Further to the rear of Columbus 370FL is a wardrobe and drawer slide with optional TV space above. There is also a king bed slide with night shelf on both sides of the bed, plus an overhead cabinet and more. Trailer has 5 pullouts, front livingroom design. King size bed in rear. Large 4 door fridge, microwave/ convection oven, washer, dryer, has an 8ft x 8ft fully finished addition included. Set up at Bear Creek golf course ready to move in to. Please call 587-297-3362 to view. 2014 Jayco Precept 31UL Class-A Motorhome. Reduced and priced to sell. Just like new. Hydraulic leveling jacks. Back up camera. cameras on side mirrors. Large Norcold 3 way fridge. Outdoor entertainment centre. Heated holding tanks. Demand tankless water heater. 2 thermostats for heat and AC. Navigation system. 3 slideouts. 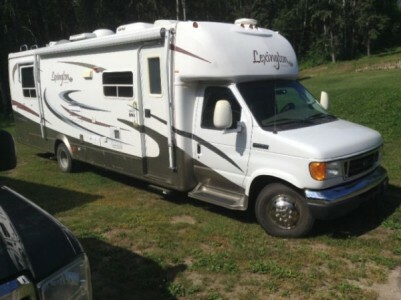 Rear queen bed, 3 TVs including outside entertainment centre. Steering stabilizer, J-Ride, protective finish, large cover. Navigation system. Electric awning, large fridge, micro-convection. 2 roof air, 5500 generator. Sleeps 6. new storage cover. This motor home has only been on 2 trips. Please call Gary 519-933-2609 to view. 2008 Tiffin Phaeton 40QSH Class-A Motorhome. This coach is full of amazing features that are sure to impress!!! 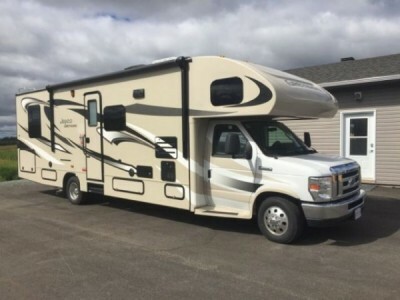 4 slides, new tires in 2014, new house and coach batteries in 2015, full awning packing including auto retract patio awning, Alcoa aluminum wheels, electric Atwood stabilizers, rear backup camera, lighted exterior storage with easy slide trays and thermos pane windows throughout. Other features include ceramic tile, raised panel hardwood cabinetry, day/night shades, new flatscreen TV with sound bar and a Panasonic surround sound audio system plus TV in bedroom as well as outside. There are two sofas in the living room, free standing dinette with 4 chairs, solid surface countertops with an expandable island for added prep space, double stainless steel sinks, 3 burner propane cooktop, convection/microwave and a 4 door refrigerator with ice maker. The bedroom is located at the rear of the coach, new king size IComfort mattress, large closet with mirrored sliding doors, large wardrobe unit plus overhead storage and linen closet which houses the washer/dryer combo. The coach also has central vac system, two furnace and air conditioning systems. Please call 807-475-3877 to view. 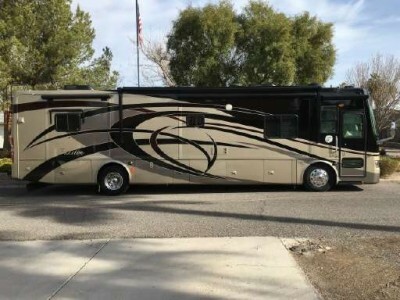 2004 Fleetwood Revolution 40Ft Class-A Motorhome. 350 Cummins, New Batteries & tires. Full complete service on front end, generator, motor, trans, Brakes. 7500 Onan Diesel Gen. Wind sensor awning (electric). In motion satellite. Master bedroom with Tv & queen bed. Leather/suede couch makes into bed, with frontroom TV. Large double door fridge, wrap around kitchen with tons of storage throughout, 2 seat eat up bar + a table. Huge bathroom with corner shower, 2 sinks, private toilet room, washer/dryer combo. Outside entertainment centre, 2 storage slides in basement. tile & carpet throughout. Please call 780-897-0178 to view. 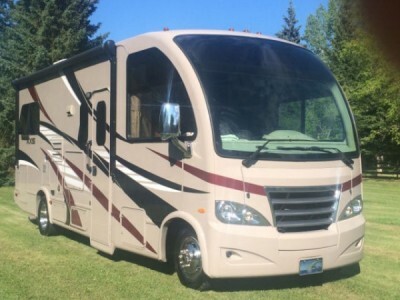 2015 Thor Axis 24Ft Class-A Motorhome. Like New with Full Load of Factory Options and GST included. Shaw satellite system installed, 3 TV's (one for patio), Generator 4K, 3rd bed (electric drop-down), Heated holding tanks, Second house battery, Power awning with LED lights. This is a "mini Class A". Thor's New RUV 'roaming, dream home'. Phenomenal driving machine with exceptional creature comforts. Please call 780-668-6148 to view. 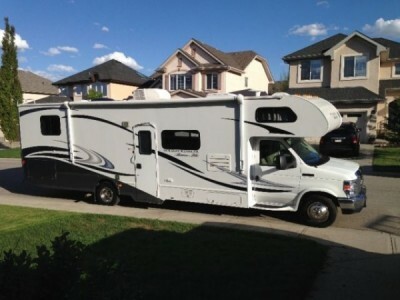 2011 Holiday Rambler Aluma-Lite 31Ft Class-C Motorhome. Rear bedroom , separate shower and bathroom areas, full side pull-out, TV's in bedroom and living room with DVD, leather couch, sleeps 8, fridge, stove, A/C, 4000 watt generator, power awning, rwar camera. Ford 450 chassis with V10 gas engine with 30,000 (48,000Km) miles on unit. Full 2 year bumper to bumper transferable warranty for drive train and all accessories. 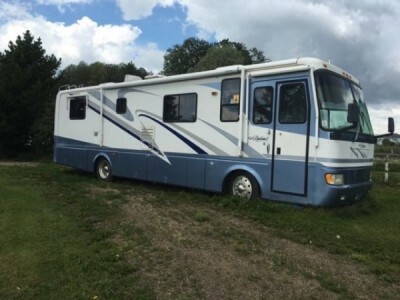 Motor home is in excellent condition throughout. 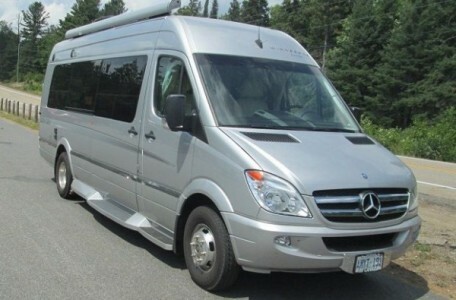 Vehicle is presently located in Vernon BC but can be delivered. Please call 780-916-8361 for inquiries or to view.